TOWSON, Md. 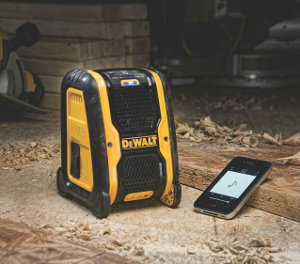 – DEWALT® introduces the launch of the new Jobsite Bluetooth® Speaker for professionals who enjoy listening to music on and off the jobsite. The DCR006 Jobsite Bluetooth Speaker is ideal for users who are very mobile and need a lightweight, portable and convenient music solution. The DCR006 can run on either a 12V MAX* or 20V MAX* DEWALT lithium ion battery, or AC power via an AC adaptor (sold with speaker). The Jobsite Speaker includes one aux and one USB Power port. Contractors can use the Aux port to play music from their Bluetooth-compatible MP3 players and devices. The USB power port allows for convenient device charging while powered by battery or AC power. The unit includes the newest version of Bluetooth (4.0) and the two 2-½” speakers on the unit produce full, rich sound. The DCR006 has a durable design including rubber over mold with rubber feet for protection from tough jobsite conditions, as well as hanging cut outs and an integrated handle for transporting around the jobsite. The Jobsite Bluetooth Speaker is designed with an easy-to-use interface including an LED light bar with large rubber buttons that can be seen from the front and top of the unit, making them easy to push while wearing work gloves. The unit also includes a mute button to quiet the device without having to turn it off, allowing the user to retain Bluetooth connection with the device. The auto-shut off feature powers the unit down when the unit is disconnected from a Bluetooth device for an extended period of time, saving battery power. The new DCR006 Jobsite Bluetooth Speaker will retail for $89.00 and be available in November wherever DEWALT products are sold. Battery and charger sold separately. With respect to 12V MAX* - Maximum initial battery voltage (measured without a workload) is 12 volts. Nominal voltage is 10.8. The Bluetooth® word mark is a registered trademark owned by Bluetooth SIG, Inc. and any use of such marks by DEWALT is under license.